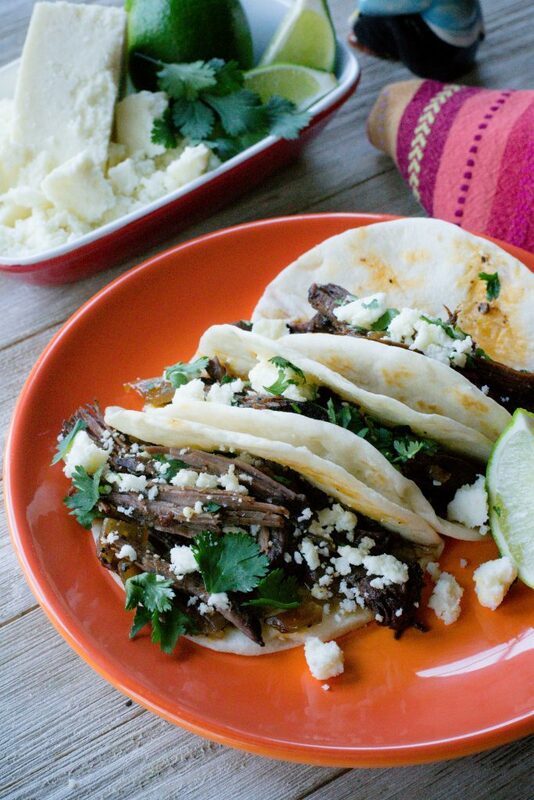 Crock Pot Street Beef Tacos - What the Forks for Dinner? 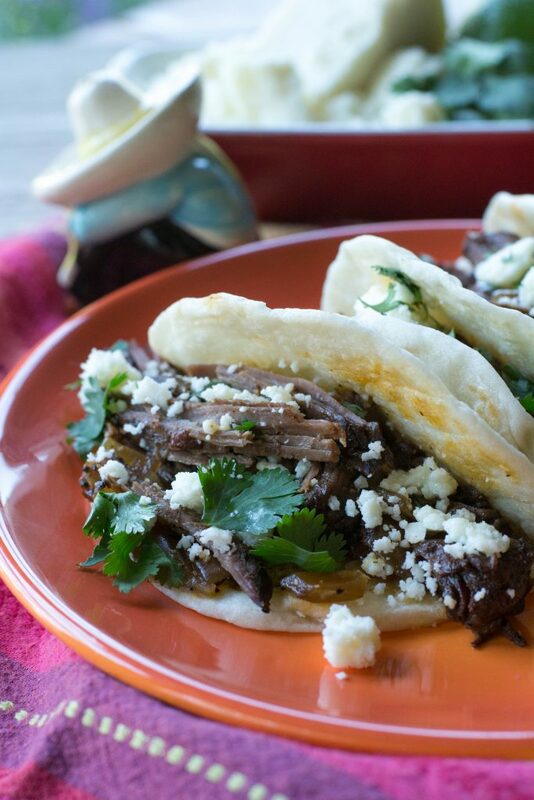 Chuck roast is rubbed with a spice mixture that embodies Mexican flavors….coffee, chile powder, cumin, and a touch of brown sugar for sweetness. Then into the crock pot and topped with garlic, chipotle peppers, maple syrup (not for pancakes….the real deal), beer, and balsamic. Low for 6-8 hours or high for about 4 hours. For the beer extending the Mexican theme I chose Modelo. Since we do not drink, and I only use alcohol for cooking, I needed one bottle……thank goodness we have a local liquor store that sells single bottles. Modelo caught my eye, it was cerveza a.k.a. Mexican beer. The can said it was crisp and clean with and orange blossom honey aroma…..it worked perfect. I also had enough to make beer bread……look for that recipe soon! So, about that coffee…. a small amount of coffee grounds added to your rub mixture for grilled pork or beef, deepens and intensify the flavors – with or without BBQ sauce. You can also add it to: pork loin, steak, ribs or pot roast, as well. The acid in coffee paired together with the earthy, soft flavors makes an excellent addition to the liquid in any meat you plan to braise. Just use coffee a good quality and grind it fresh if you can. Street Tacos have gained popularity recently, so I figured I should do a little research ….here’s what I found…..A “street taco” is a simple, more traditional taco….soft corn shell, meat of some kind, usually beef, pork or chicken and served with onions, cilantro, and salsa. Street food in Mexico or Antojitos……little cravings, are prepared by street vendors. Most vendors are open in the morning and evening. In Mexico the mid day meal is the main meal of the day so most vendor are not open. According to Wikipedia Mexico has the most extensive street food culture in Latin America. Mini or “street” tortillas are now available at your local grocery store in both corn and flour varieties. I used them in my Mini Crab Rangoon Tostadas. Which are totally not Mexican, but delicious, and used the mini taco shells. Staying true to the “street taco” I used only cheese and cilantro for topping the meat, simple and basic. Cotija is a hard crumbly Hispanic cheese made from cow’s milk. 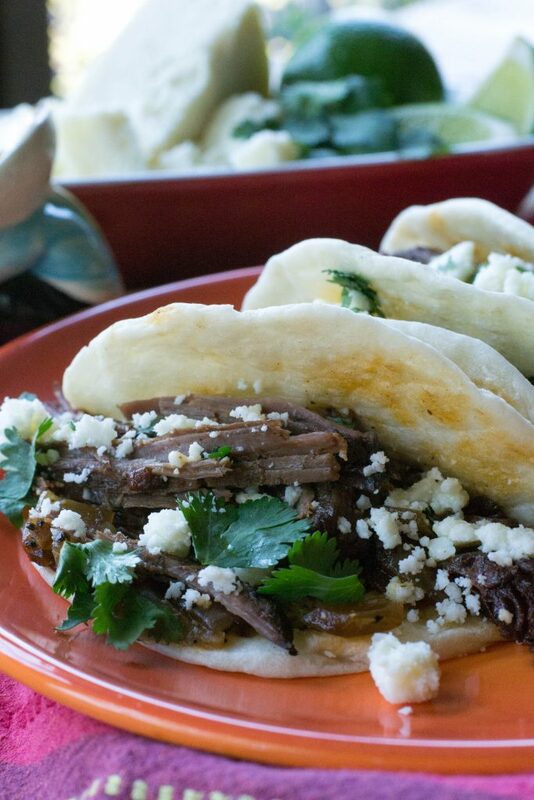 It a white cheese with a salty, strong flavor that stays firm and will actually not melt, so it perfect for tacos. But it is strong so, if it’s not your cup of the use your favorite cheese. The prep of the meat took literally less than 15 minutes and once in the crock pot you can walk away. 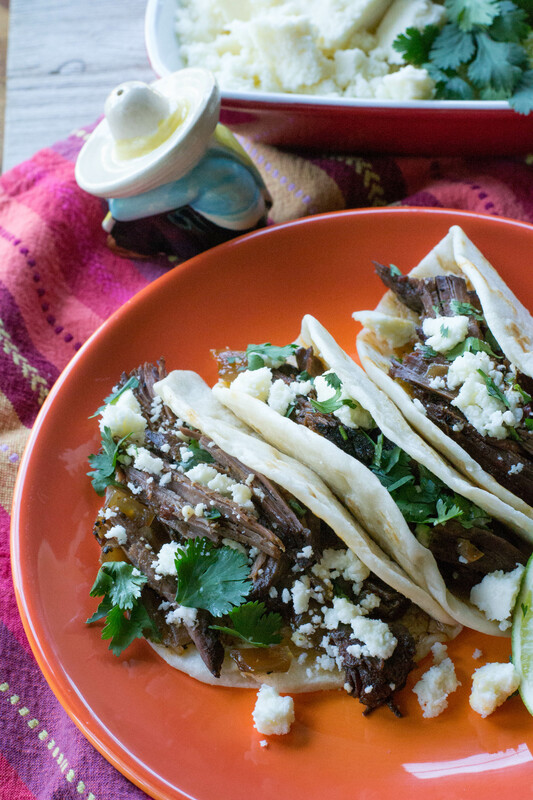 Come back later and once you shred the meat ( again just a few minutes) and you have Crock Pot Street Beef Tacos. Whether for a snack or for lunch or dinner it’s a step to the street …..delicioso! In a large shallow container, whisk together the coffee beans, and the next 6 ingredients. Place the chuck roast into the spices. Pat and rub the spice mixture all over the beef. Place the chopped onions in the bottom of your crock pot. Place the spice-covered chuck roast over top. Top with garlic, chipotles, maple syrup, beer, and balsamic vinegar. Cover and cook : low for 6-8 hours, or on high for 4 hours. Remove the beef from the slow cooker and shred. Return shredded beef to the crock pot to keep warm. Heat tortillas. 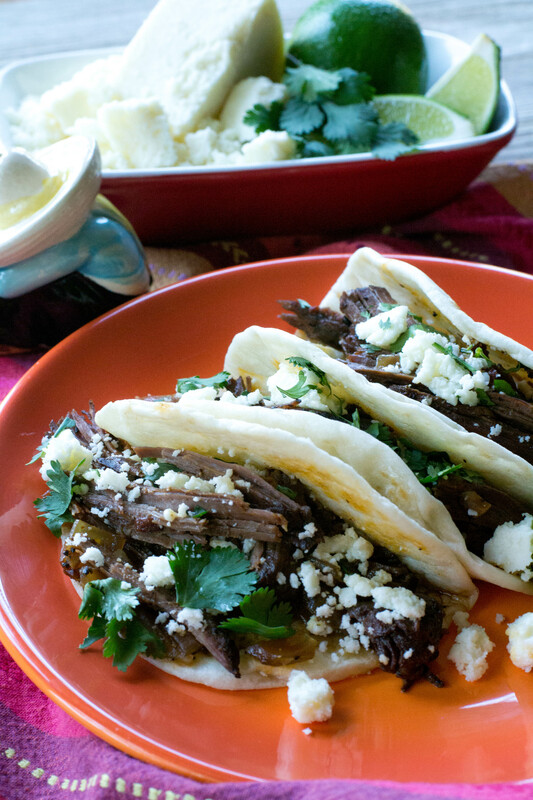 Fill with beef, cheese , and garnish with cilantro.